It seems as though the age of the mini-bust has passed. Once a premiere format for collectibles, they tend to languish these days, and no longer sell in the numbers that they once did. I remain a fan, however, at least when they are done well. They are sometimes the only collectibles we get for certain licenses...and sometimes they are the only decent ones amongst the flotsam. Case in point - the Walking Dead. We have yet to get any decent figures, although to be fair the McFarlane releases have really improved in quality, and the upcoming sixth scale figures from ThreeZero look good so far. There's a downside to both though - 4" figures don't exactly jump off the shelf with their realistic sculpts, and ThreeZero figures are likely to make your wallet moan. So when Gentle Giant announced they were producing mini-busts, I was all over it like hair on a bear. It's a format that will allow for plenty of different characters, and should remain cost effective. 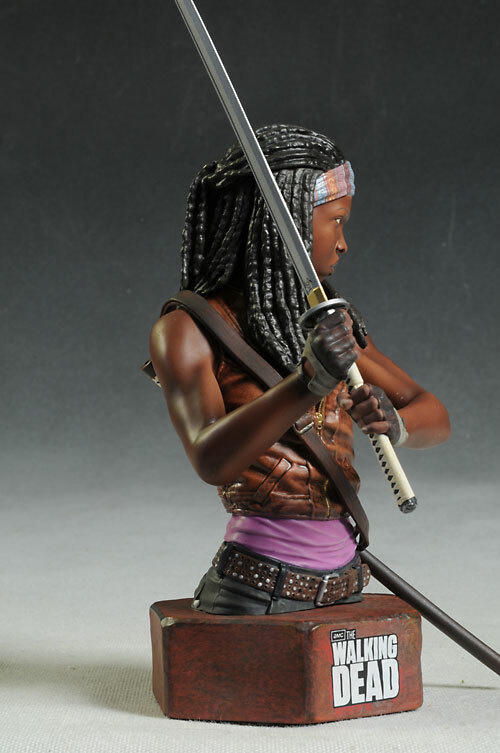 Their first release is the SDCC exclusive Michonne, limited to 750 busts. That's a pretty low production number, and the price reflects that - $80. 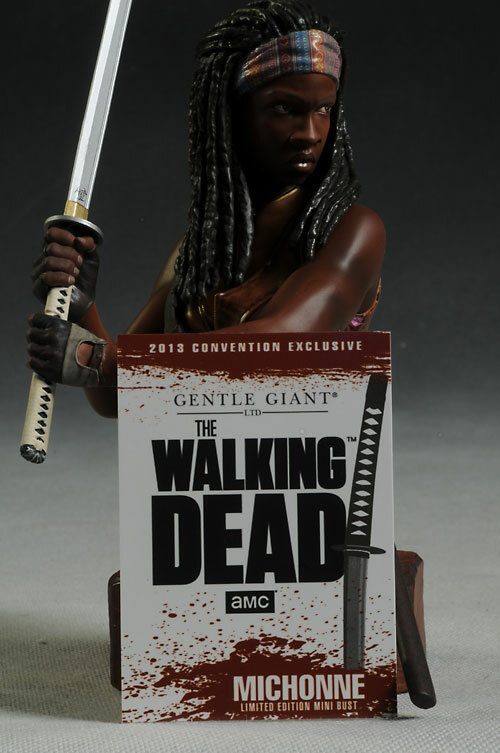 The regular releases that have been announced so far include Rick Grimes, the Governor, Daryl Dixon, the 'well walker' zombie, and the 'Sophia stalker' zombie. These all run the more standard $60 - $70 each or so, depending on the character and the retailer. 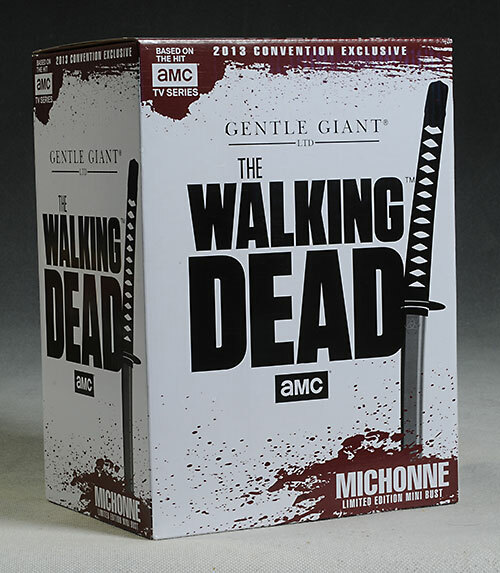 There's also a unique version of the Governor and Daryl that you can only get directly from Gentle Giant. I complain alot about the white boxes that DC is using now, and for good reason - they're dull and boring. Simple isn't the problem, because simple can be great when done right. That's a long way around to saying these white boxes are great. There's a nice use of blood for color, and the inclusion of key graphics makes it pop. It also helps that they've continued with the cool baseball card style Certificates of Authenticity. I know people who don't collect the busts, but do collect these cards - that's how cool they are. Looking at the photos, you might wonder why my score is this low. 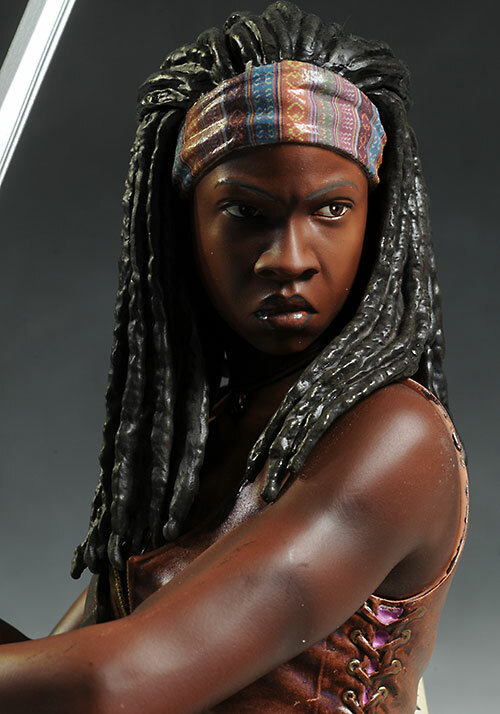 It really does look like Michonne, and the deadly stare mimics her usual expression on the show. They've also captured a nice pose with the sword (which has an all metal blade), and the clothing and base have some nice detailing. There's also more texture here than we've seen with most Gentle Giant busts, but it's still not quite enough. The material has wrinkles and layers, but it's still pretty smooth. The belt and hair have the most texture, and both of those are still a tad soft. The softness to the hair sculpt is one of the reasons I dropped the score a bit, but not the major reason. It's actually very difficult to see the biggest issue in photos, but in person it really freaks you out. She has the pointiest forehead I have ever seen. It's almost a tent - you could cut paper on it. Her forehead is as pointed as her nose...it really looks weird in person, like someone squished her skull on either side. If you can get past that, you can add another half star to the score, and if you're okay with the hair, then you can give this a full star extra. The paint is well done, with clean lines and some very nice detailing. The colorful head band looks great, and the eyes are sharp, even and aligned. The skin tone is good, and they've even done a great job on some bruising and dirt. The rest of the clothing has a very realistic paint job, and the muted colors look very nice. Paint work has not always been the best feature of busts like this, but they've done a great job on this one. This one is a little expensive, but the exclusivity makes it a bit understandable. The regular releases are still around $60 - $70 at most retailers, which is about the same price that they've been for several years. 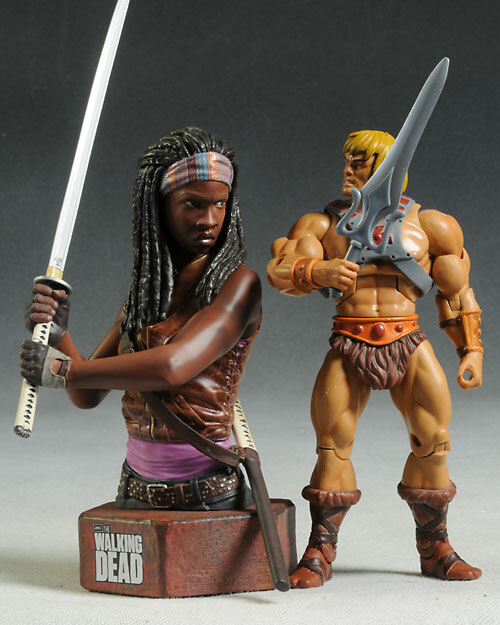 Astute observers will remember that NECA did a couple busts awhile back, but I have to say that the Gentle Giant versions will be a big improvement. I prefer their style, even if busts technically don't have arms. While I have some issues with the weird forehead - and believe me, in person it's outright bizarre looking - and soft hair sculpt, I really do like the likeness and pose. 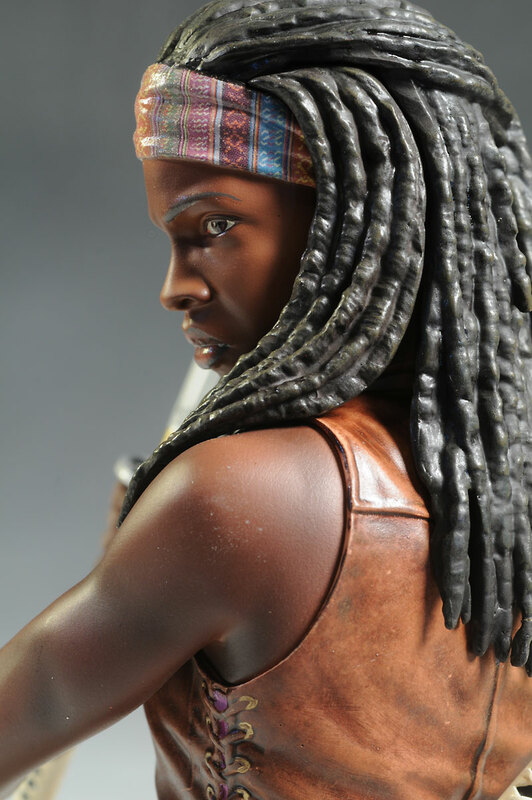 This bodes well for the rest of the line, and I'm hoping that the likenesses on Rick, Daryl and the others are at this same level. - has an excellent pre-order price of $60 for most of the upcoming characters. 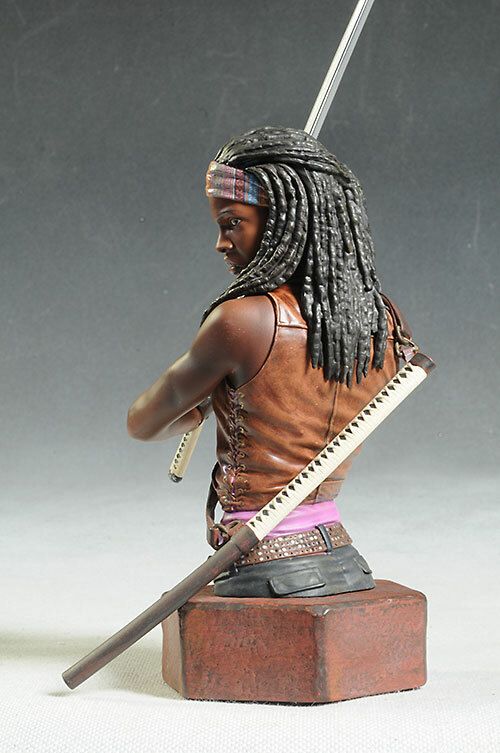 - doesn't have Michonne, but they do have the rest for $65 - $75 each on pre-order. - is in the $80 ball park. - Entertainment Earth is on the more expensive side, running around $80 - $85 each. 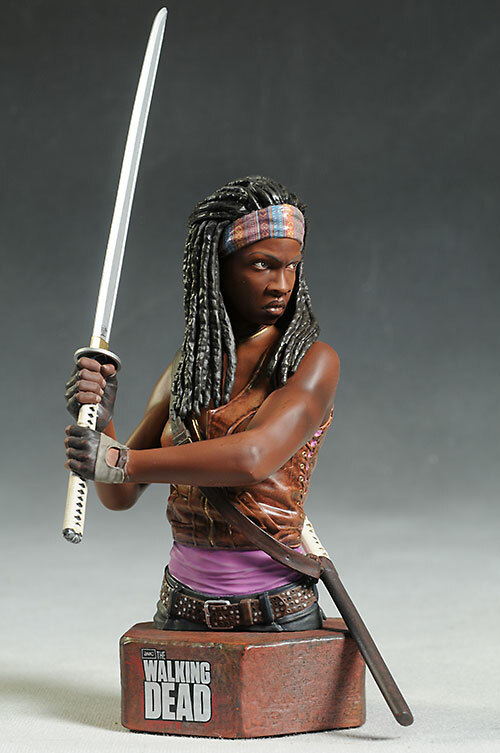 Other Walking Dead reviews include McFarlane figures from the TV series 3, the RV and Well Zombies, Shane and the Bicycle Girl, Walking Dead figures series 1, the two humans in series 2, as well as the first series of comic based figures. 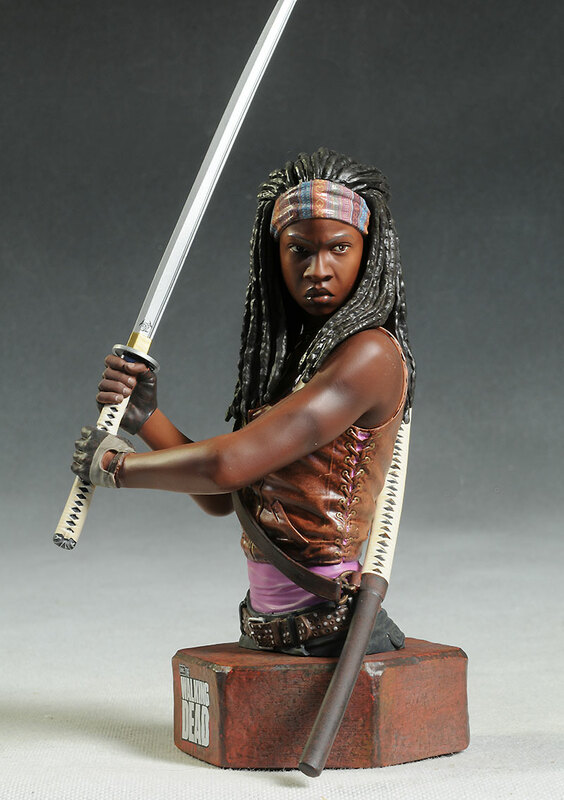 And don't forget that NECA is doing busts, one for the 'biter', and one for this 'walker'. And if you like the RV Zombie, Mcfarlane also did a cool blu-ray case using his head.